Stealing cars in many countries is very common and a headache problem. Is there anything we can do to prevent this from happening, or how can we retrieve our lost car? Yes, iStartek has a solution for you, we can help you find your lost cars via Car location tracker. But what is car location tracker, its a kind of tracker can be used for car tracking, location checking, we can check it by SMS command or web-based tracking platform, so we also call it vehicle location tracker, online location tracker or automobile location tracker? How we make car location tracker work? Normally you just need to insert a sim card on car location tracker, which support GPRS Service, send/reply SMS and caller ID Display function, then do some simple testing, car location tracker will go online on web-based tracking platform, you can check where is your vehicle. If you do not want to use web-based tracking platform, you can check vehicle location by sending SMS command or make a missed call to car location tracker sim card, it will reply you an SMS back which includes Google location link, its very convenient. How car location tracker help us find lost cars? 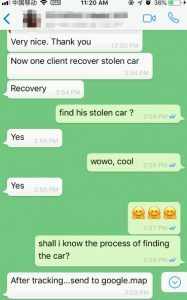 About a few months ago, one of my Nigeria clients contacted me on Whatsapp, he said his client car was stolen, the car was installed our VT600 Car location tracker, its very urgent, but they didn’t know how to find the car back, because the car is not at its original place, they lost direction for how to find it. Firstly I let them send one SMS command to cut off the engine, this function is very easy to achieve by SMS Command remotely. Then let them check this car current location on web-based tracking platform, about 15miuntes later, they messaged me back, said the lost car was found. Below is another client from Mozambique, his client also found the lost car by checking location via car location tracker VT600. If you have any query for Car location tracker, please contact us freely, who we are? We are a manufacturer in China for GPS tracker and router since 2009, there are various products, such as car location tracker VT202 for motorcycle track, which supports wide voltage power supply from 9V to 100V. 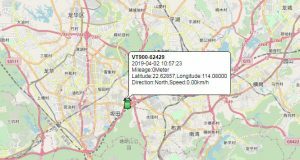 For car/ bus/ taxi tracking we have vehicle location tracker VT600 which support multiple functions such as fuel monitoring, temperature monitoring, ACC Detection, etc. Or if you want Longtime standby automobile location tracker with a magnet, our best car tracking device VT100 is recommended, it has a strong magnet with built in 5000mah battery.